Living on the windiest farm on Windy Hill is not easy. Some days the pigs are nearly blown away, and one day half the house is blown away. But Mum comes to the rescue. Not only is she an inventor (love the heavy metal shoes that keep everyone grounded) but she comes up with the idea to save the farm. Why not harness the wind and build a wind farm? 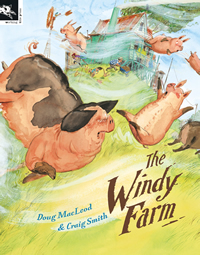 This funny and tongue in cheek picture book not only tells the story about the windiest farm on Windy Hill, but also sends a message about the environment, especially sustainability and harnessing wind power. Issues that are very current. Smith’s delightful and detailed illustrations add to the sense of humour of this book. The image of Grandpa with his favourite pig, Big Betty and the pigs and chickens in the background wearing Mum’s metal shoes is one of my favourites. I also love that the wind becomes a character, appearing in every page. This would be a good book for younger readers, but lower primary school children would also find this a good jumping off point for discussions on the environment and issues such as sustainability and energy consumption.